Driving while under the influence of drugs or alcohol is dangerous, especially for motorcycles. Motorcyclists are 28 times more likely than other motorists to die in an accident, and factors such as intoxication can increase this risk. A 23-year-old man from Brandon was killed after rear-ending a truck whose driver was intoxicated. The fatal motorcycle accident occurred on the morning of February 22 on Interstate 4, near State Road 574. The motorcyclist was riding behind a Dodge Ram when the motorcyclist attempted to pass the truck. The motorcyclist rear-ended the truck and later died from his injuries. The driver of the truck, a 39-year-old man, did not stop. He kept on going, traveling east on Interstate 4 and then going north on Interstate 75. The man then turned around and went south, and that was when troopers caught up with him. The man was arrested for several charges, including DUI, hit and run and driving with a suspended license. Motorcycle crashes can occur in a variety of ways. While the motorcyclist in this case is partially to blame for his death, since he did rear-end the truck, the driver of the truck is also at fault for driving while intoxicated and without a valid license. Motorcycles offer no protection for riders, so even the most minor accident can be deadly. 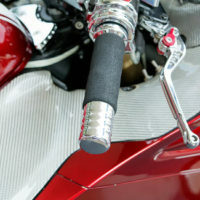 There are many ways in which motorcycle accidents can occur. A common one is unsafe lane changes. Motorcycles are much smaller than passenger vehicles, making them difficult to see. This means that motorcycles are hard to see in blind spots, causing serious collisions. Speeding – on behalf of the motorcyclist or another motorist – can also lead to accidents. Going too fast can cause a driver to be less likely to avoid a crash. Left turn accidents are also common. Because motorcycles are hard to see, motorists often turn left in front of them, causing crashes that result in serious injuries and even death. Lack of experience is also a factor. Motorcycles are different from cars. They require more balance and control. A rider who is not skilled at riding a motorcycle can easily crash. Road conditions are also likely to cause motorcycle crashes. Potholes, debris, puddles and gravel roads may not be a big deal for most motor vehicles, but these issues can cause a motorcycle to lose control. A motorcycle can fall down and a rider can be easily ejected by hitting any of these road hazards. Motorcycle crashes are naturally more likely to be fatal than other types of accidents, and this is especially true when alcohol is involved. Even the most careful motorcyclist cannot avoid an accident when other drivers are negligent. If you or a loved one was seriously injured or killed in a motorcycle accident, seek legal help. The knowledgeable Dade City personal injury attorneys at Mander Law Group can assess your case and help you obtain the compensation you deserve for your injuries. Call (800) 557-0411 to schedule a free consultation.